Have I told you how much I love milk paint? I do, and French Enamel is one of my favorite colors. 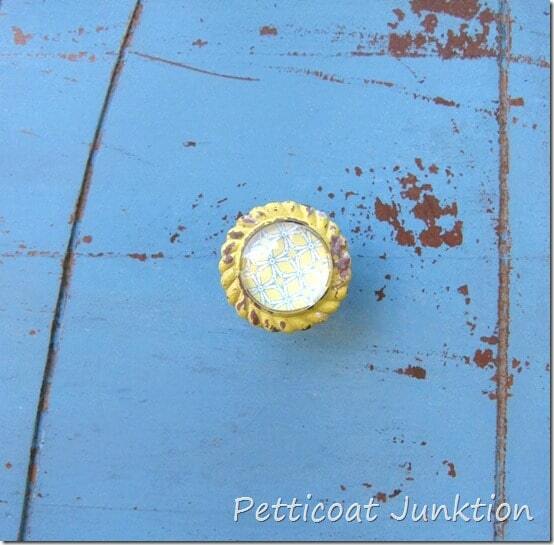 I added yellow knobs to the chest to contrast with the French Enamel and the makeover is soooo pretty. Perfect for a nursery right. 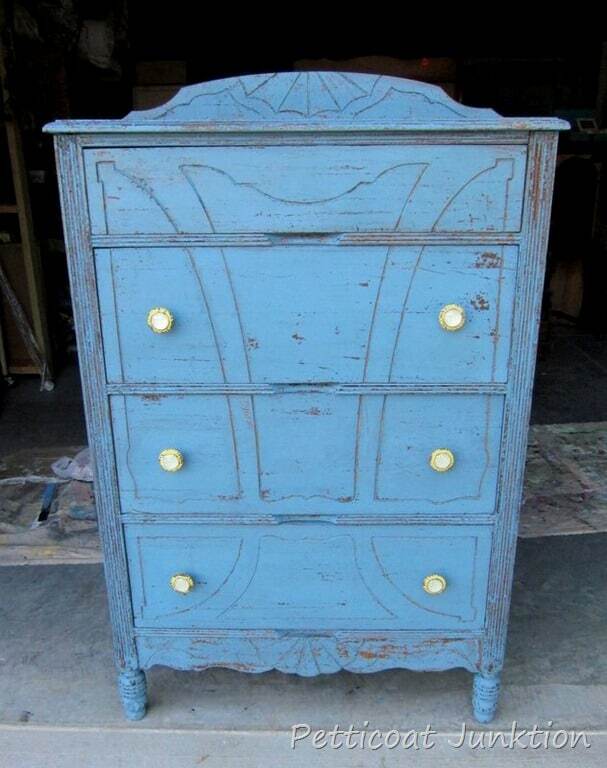 The French Enamel in Miss Mustard Seed Milk Paint is somewhere between turquoise and blue. The chipping on this piece was just right. As Marian shows in her MMSMP videos, I used a putty knife to gently scrape off the chipping paint. 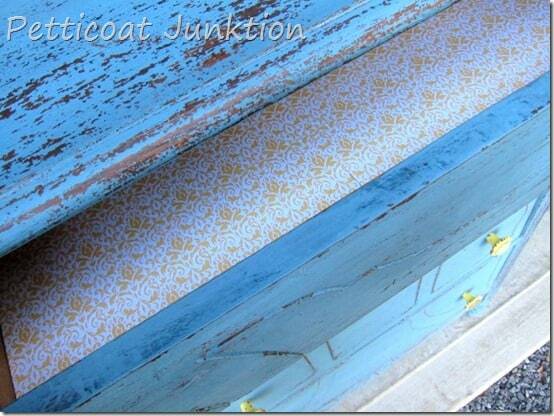 Drawers lined with scrapbook paper. 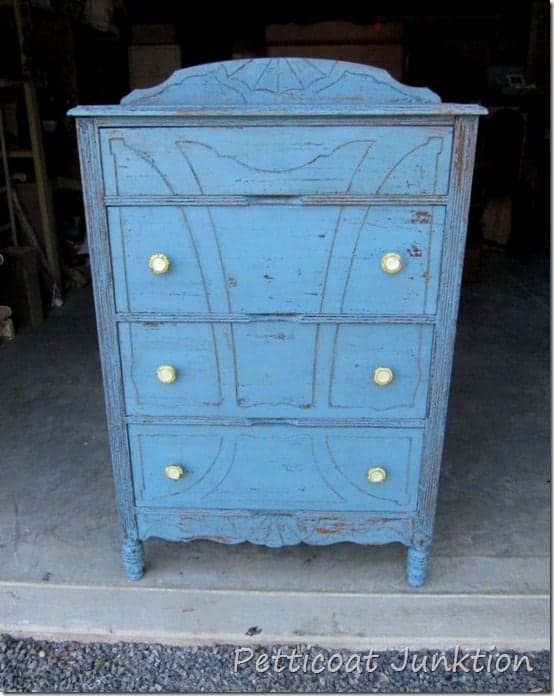 Mixing the French Enamel Milk Paint….. 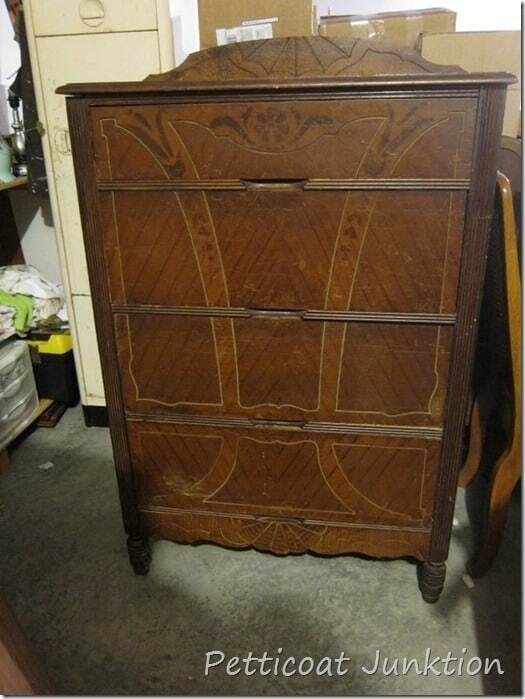 This chest of drawers had cut outs on the frame between drawers for opening the drawers. I drilled holes and added knobs for an up-dated look. I like the old and the new together. The finish is one–of- a- kind. The unique aspect is that you never know what result you will get! 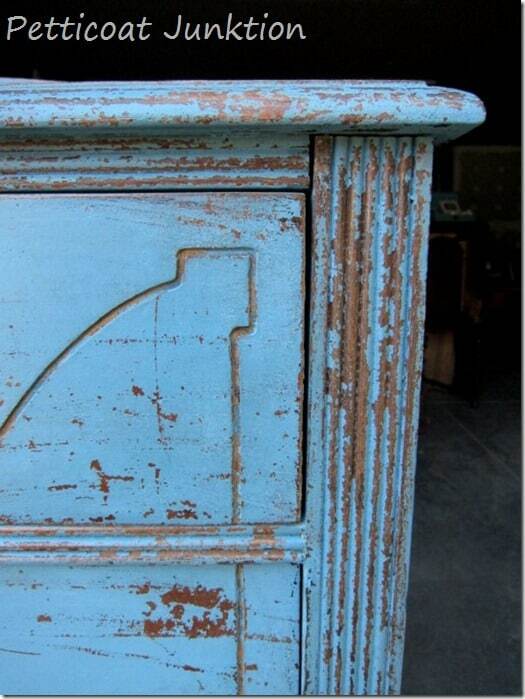 You need to take in to consideration the original finish on the furniture. I have found that highly varnished pieces will chip a lot or the paint may crackle instead of chip. A lacquered surface will chip very, very heavily or chip off completely so you might want to use the bonding agent. An older wood piece without any varnish or gloss may not chip at all. 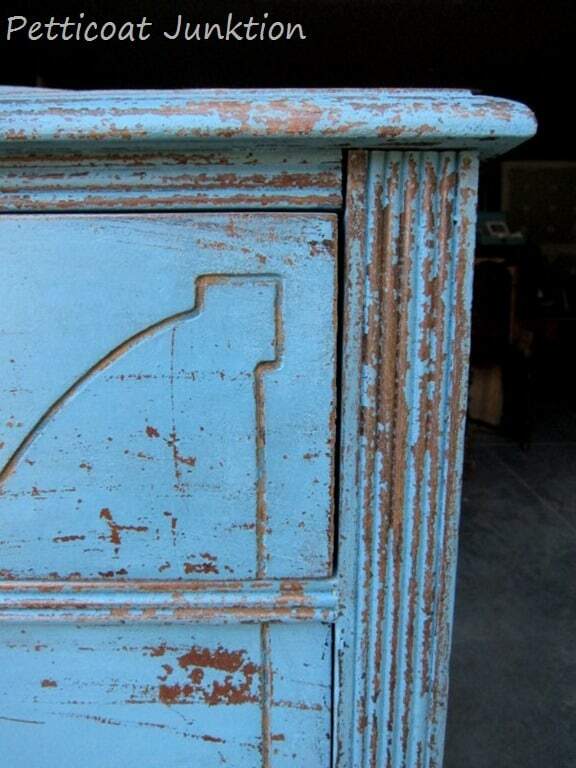 On an unfinished piece of furniture the wood will soak the paint up and it will not chip. 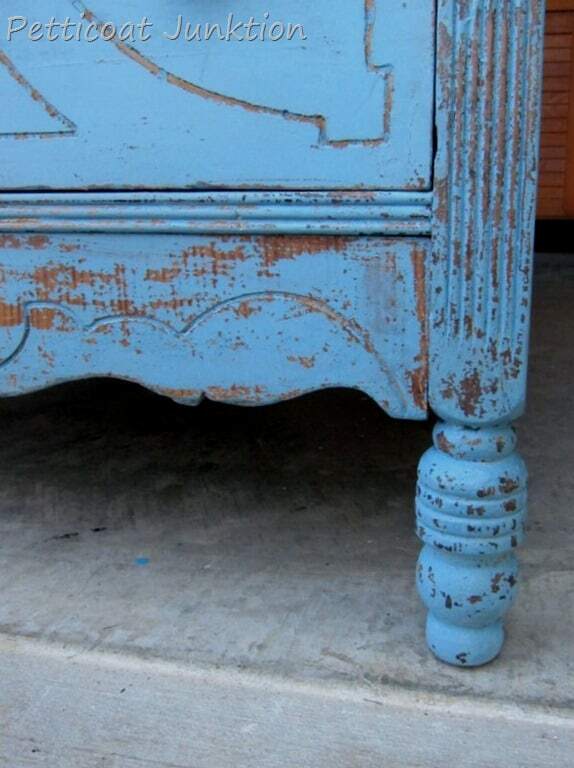 If the furniture piece has a coat of paint, the Milk Paint may crackle instead of chip or it may not chip at all. My advice? Just have fun and go with it. Do you like the look? The MMS Milk Paint is fast becoming one of my favorite paints. 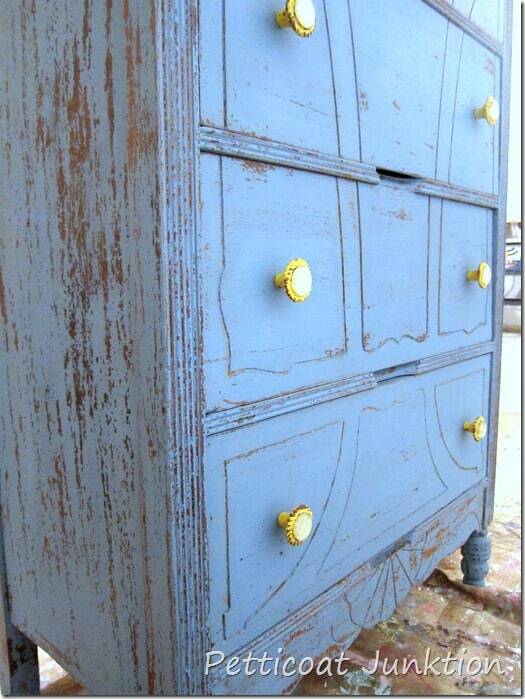 Love the chippy look and those knobs are flat out gorgeous! I just adore this piece. 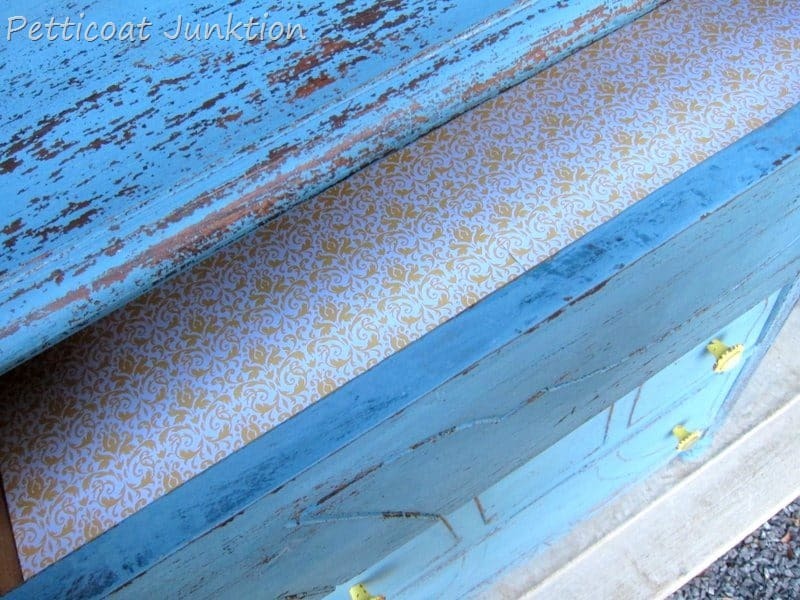 Blue has been my fave lately and along with the carved details and those knobs, it is just perfect:) If you have a sec, I would love for you to share at Get Schooled Saturday at Too Much Time On My Hands. That’s terrific!! 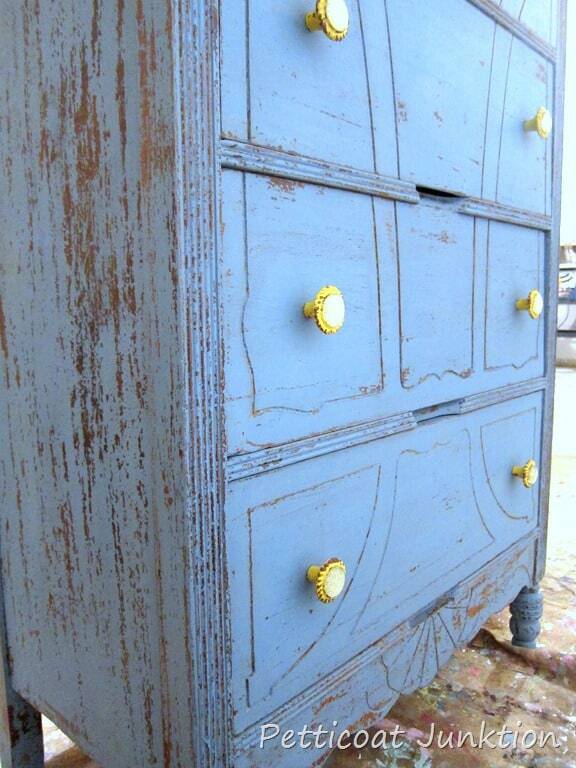 I can’t wait to get my new box of MMS paint colors! you should get it tomorrow!! I love this, Kathy!! Another excellent job! Blessings! i love this!!! the color is so fun and love the chippiness. i have a sample of this color i can’t wait to use! 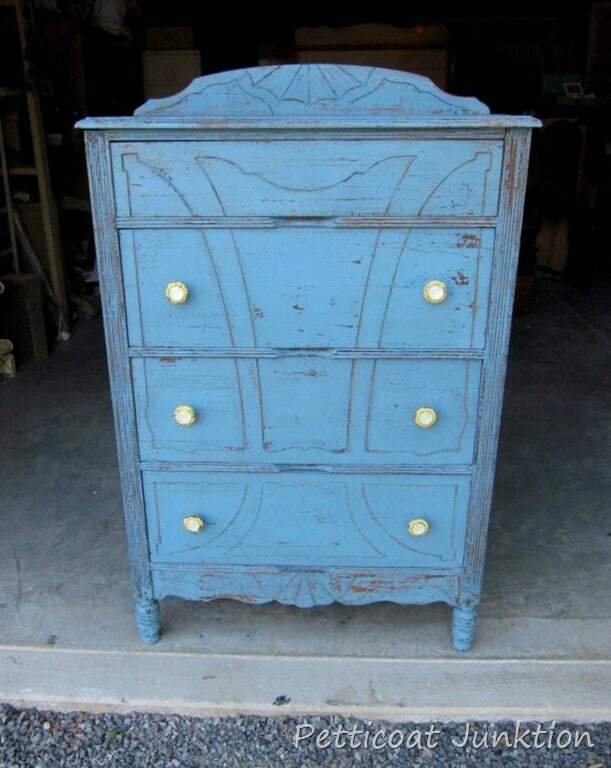 I know, I just love the blues in the milk paint. Can’t wait to see your project!